And with that prophetic speech, the Hampton Roads Bridge-Tunnel (HRBT) was opened for the first time, connecting the Peninsula to Norfolk and Virginia Beach. Consisting of man-made islands, trestles and tunnels, the original two-lane vehicle crossing was, and still is, a towering engineering achievement. While travelers might bemoan the awful traffic congestion consistently faced at today’s four-lane HRBT, the expanse has indeed destroyed distance and conquered time. It’s also greatly enabled commerce, brought communities together and made it easier for the outside world to enjoy the region’s bounties. Now, after years of studies, plans, commissions and community angst, this venerable tube—nicknamed “Hampton Roads No. 1” by appreciative engineers worldwide—is about to get some much-needed relief. But how did we get here? And how did this thing ever get built in the first place? 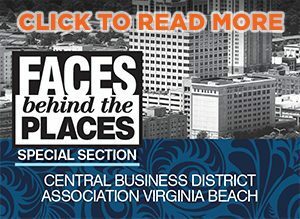 On the 60th anniversary of it’s opening, we tell you why you should care about the Hampton Roads Bridge-Tunnel. Before the construction of the 3 1/2-mile crossing, visitors to and from the Peninsula had to take a 30-minute ferry ride—a system that could accommodate approximately 2,500 motorists a day—or embark on a long, 25-mile detour via Rt. 17 and the James River Bridge. There were two main ferry routes—one that ran from the Norfolk Naval Base to downtown Newport News, and another that traveled from Norfolk’s Willoughby Spit to Fort Monroe in Hampton. At a cost of $1.25, plus 20 cents per passenger, the tunnel could get motorists across the harbor in seven minutes. Within a year, more than 6,000 vehicles were passing through its portals daily. Hello, neighbor! With a $44 million price tag, the HRBT included, at that time, the largest underwater trench-type tunnel in the world—7,479 feet long from portal to portal—and the first to be constructed between two man-made islands. 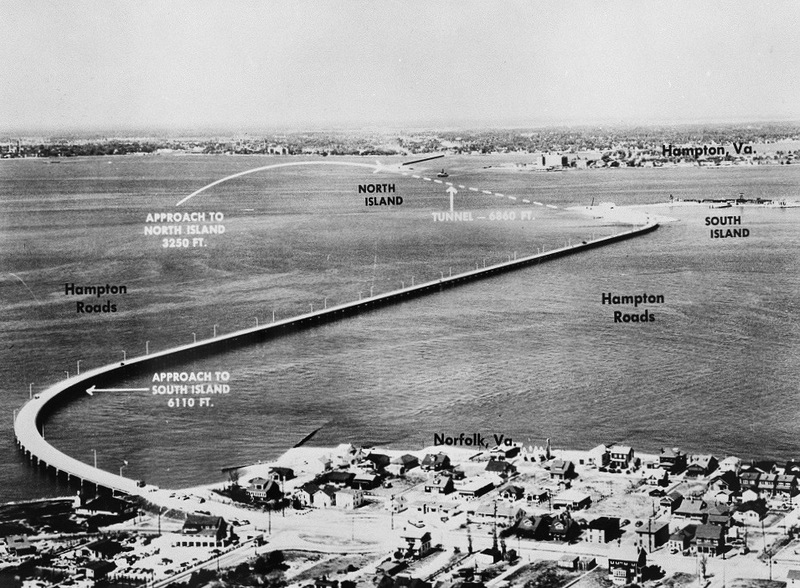 A tunnel was necessary because a conventional bridge would block and potentially hinder Navy vessels. The original design and engineering team was the New York firm of Parsons, Brinckerhoff, Hall & Macdonald, and the construction firm was Merritt-Chapman & Scott, also from New York. 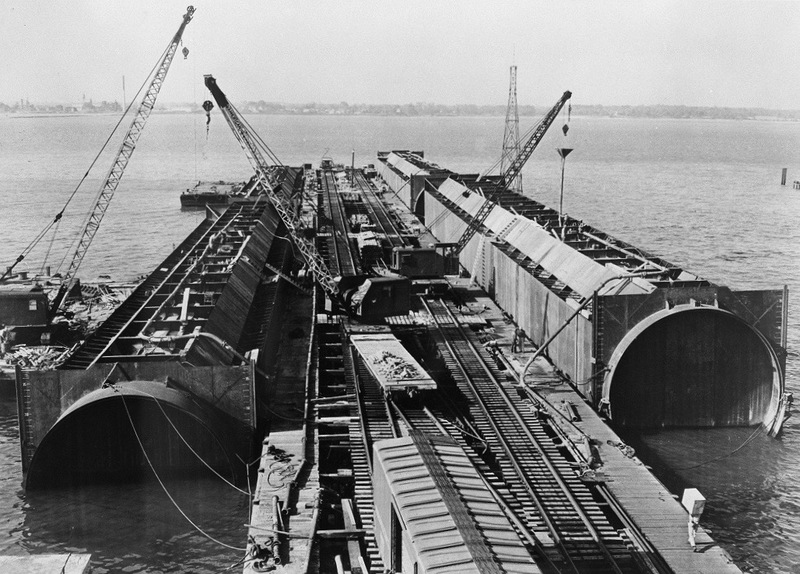 The two firms also concurrently oversaw the engineering and construction of 23 miles of approach roads to the tunnels, and Merritt-Chapman & Scott built both the bridge-tunnel sections and the man-made islands, which were designed to link the trestle bridges to the tunnels (using more than 5 1/2 million pounds of “fill” dredged from the bottom of the Bay). The artificial land masses were named North Island—connecting to the Hampton tunnel entrance in Phoebus, where tunnel construction started—and South Island, on the Norfolk side near Willoughby Spit. 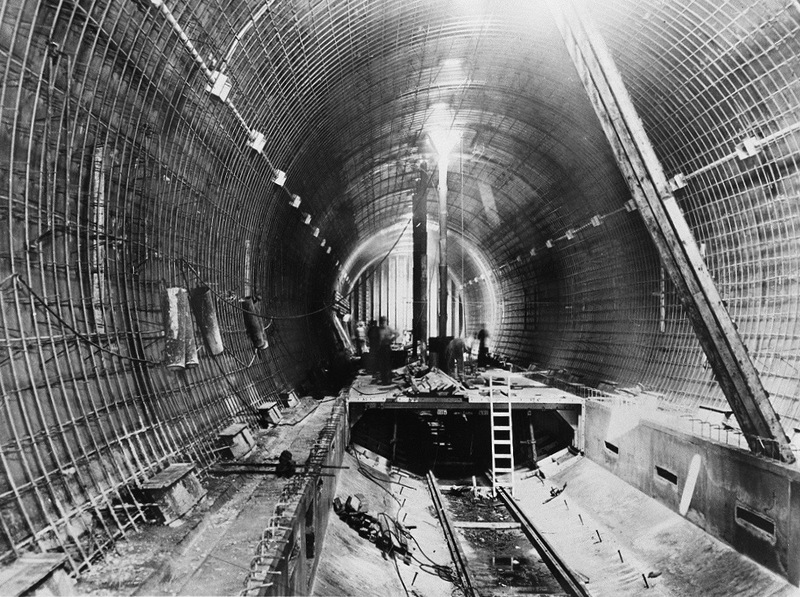 The tunnel was formed from 23 double-shell steel tube sections, each of them 300 feet long and requiring nearly 600 tons of structural steel to construct. They were fabricated by the Baldwin-Lima-Hamilton Corporation of Eddystone, Pa. 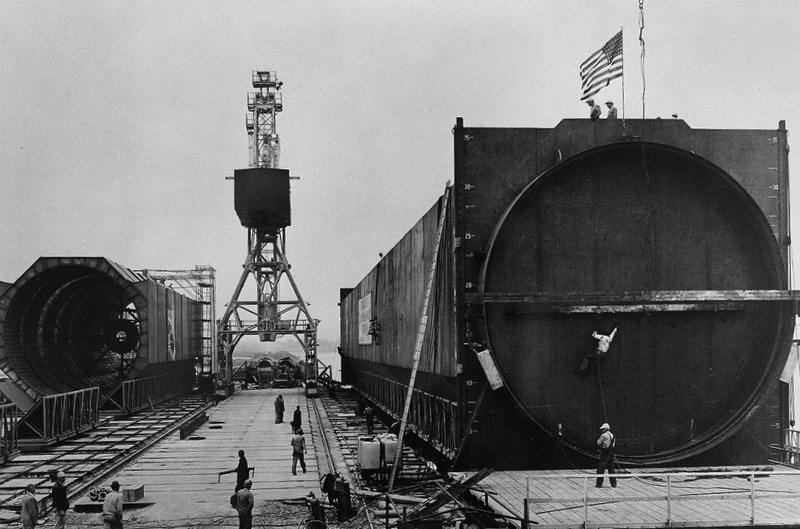 The octagonal outer tube shells were 37 feet in diameter, with the circular inner shells each measuring 33 feet. 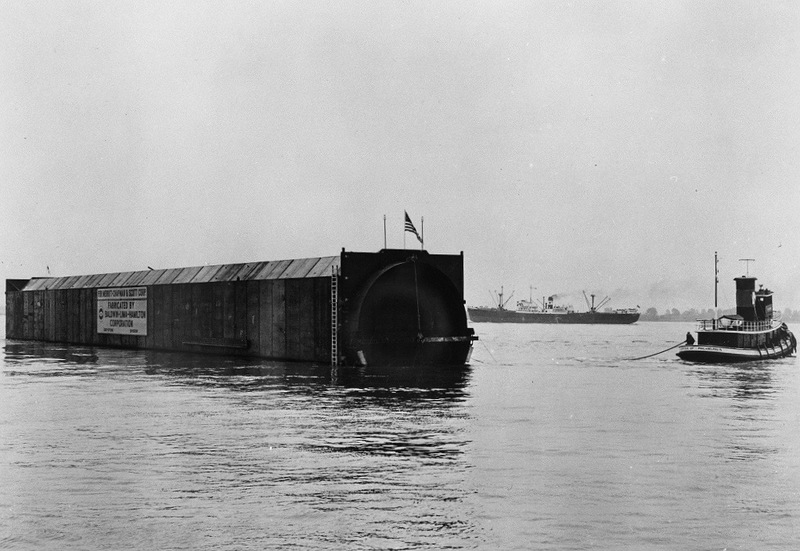 These 23 behemoth steel tubes, adorned with watertight bulkheads at both ends, were transported 250 miles by tug boats down the Delaware River to a “shape up” basin in Hampton Roads, 6 miles from the tunnel site. Here, the tubes were lined with an inner ring of concrete fill and fitted with roadway mats and a 2 1/2-foot sidewalk. They were also outfitted with water and drainage pipelines, electrical boxes and outlets, ventilation ducts/flues and telephone and traffic controls. When completed, one single tube section could weigh as much as 12,000 tons. 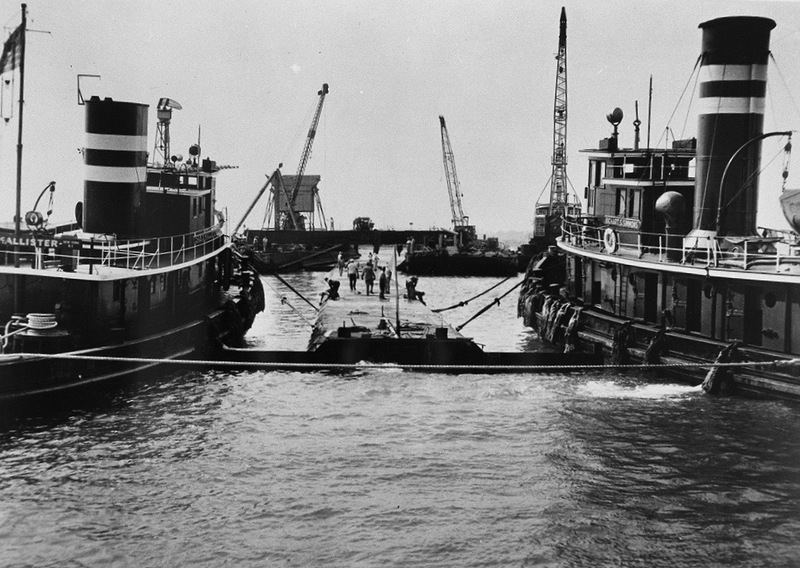 The 23 separate tubes were each towed by tugboats, one by one, and lowered into a trench lined with gravel that had been dredged from the bottom of the harbor. To sink the individual sections, concrete was poured in open pockets between the inner and outer shells. Once it slowly sank, it was guided to the bottom, and into place, by two barges. When a tube was in the right position in the deep trench—and there was little margin for error—more concrete was added, including solid rings built around the tube’s outer joints, which were grounded with a 5-foot covering of sand. Working inside, from tube to tube, workers would cut through the watertight steel bulkheads between sections, and the joints were welded together and affixed with an inner ring of concrete. At its deepest point, the combined sections of the tunnel rested 113 feet below the water’s surface. In the final stages, the 23 joined sections were topped with a ceiling of preformed metal, and nearly 2 million 4 1/2-inch ceramic tiles were placed on the inside sidewalls. The roadway was topped with asphalt, and lighting fixtures and sidewalk railings were then installed. The creation of this historic bridge-tunnel took three years from start to finish. 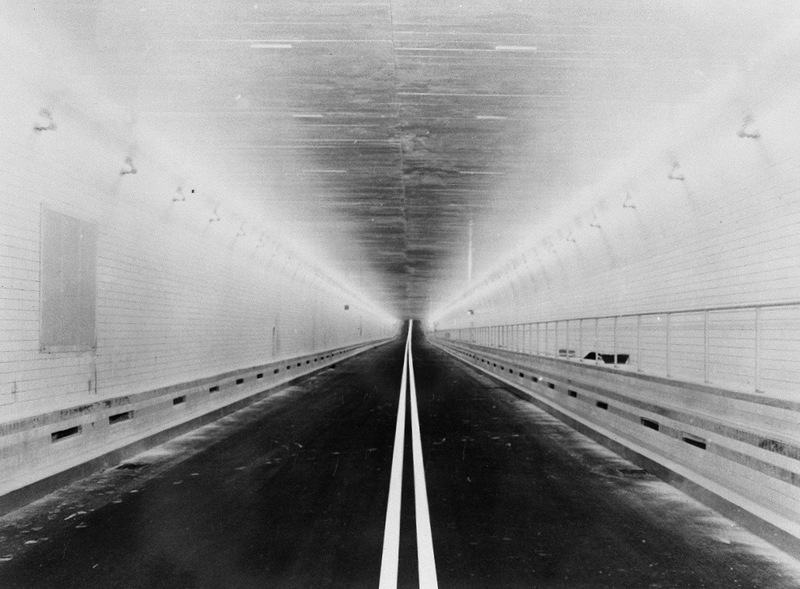 Even before the first tunnel opened, local opinion makers in 1957 predicted that a second tunnel—and at least two more lanes—would be needed to service the anticipated growth of Hampton Roads. They were right—congestion grew with demand—but it took 19 years to happen. From 1972 to 1976, another tunnel was built alongside Hampton Roads No. 1, consisting of 21 steel tube sections. When it opened, the new construction became the eastbound tunnel and the old HRBT became the westbound. The construction of this much-needed $95 million second tube was largely funded as part of the Federal-Aid Highway Act, with only 10 percent coming from Virginia taxpayers. The result—finally—was four lanes and a toll-free highway. What has been charted is the negative economic impact of the structure’s congestion, such as a TRI study conducted by Cetin that estimated from 2013 data that the Bridge-Tunnel’s congestion and delays cost the traveling public approximately $33.2 million annually. 72 percent of this was due to high traffic while the rest was incident-related—over-height trucks, crashes and disabled vehicles. 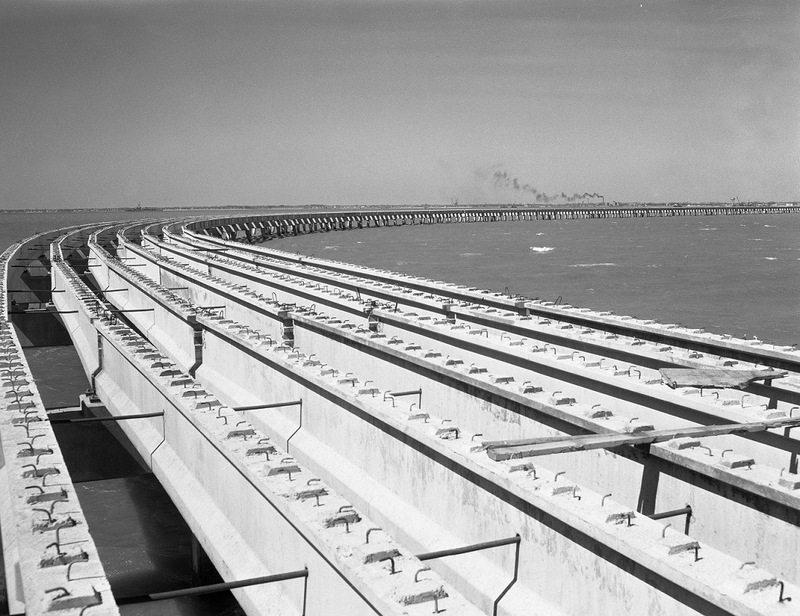 In 1964, the privately-owned Chesapeake Bay-Bridge Tunnel opened as the largest such facility in the world, the 17.6-mile span connecting Virginia Beach to the Eastern Shore. By the 1980s, plans began formulating for another Tidewater crossing to alleviate congestion. The VDOT-controlled Monitor-Merrimac Memorial Bridge-Tunnel came on line in 1992, connecting Newport News and Hampton to South Hampton Roads. Of the three, the HRBT still has the longest tube passage at 7,479 feet each and probably lets the other bridge-tunnels know it. You don’t have to tell area motorists that the Bridge-Tunnel area is cited as one of the most congested traffic corridors in America. They knew that in 1996, and it only took 20+ years of feasibility reports, environmental impact studies and citizen outreach efforts—and countless traffic snarls—for there to be a concrete plan to expand the HRBT with another tube. Yep, it’s finally happening. But, perhaps just as important, there will also be a concurrent expansion of Interstate 64. The ambitious $4 billion overhaul, slated for completion in 2024, will be funded through a 0.7 percent regional sales tax surcharge and a 2.1 percent regional fuel tax hike. “With this funding available, projects that had been on the shelf for decades have finally been moved to realization,” Gross says. And, yes, there will be tolls again, but voluntary ones. The plan is to include an electronic system that will enable single drivers to use less-crowded high occupancy lanes … for a fee. Yes, but will “Hampton Roads No. 1” continue to destroy distance and conquer time, as Gen. Anderson foretold six decades ago? Cook smiles because he knows the quote by heart. Everyone at VDOT does. For more on the Hampton Roads Bridge Tunnel expansion, visit VirginiaDot.org/HRBT. From the Virginia Department of Transportation (VDOT) archives: Construction photos of the original Hampton Roads Bridge-Tunnel, which opened on Nov. 1, 1957. Its historic underwater tube was formed from 23 double-shell steel sections, each of them 300 feet long and requiring nearly 600 tons of structural steel to construct. With trestles and adjoining man-made islands, the creation of this historic bridge-tunnel took three years from start to finish.